As much as I would like to have lush surroundings right now, I have to be a little patient to allow mother nature to come into full bloom. I've seen hints of buds, flowers, leaves and other activity out in the landscape during my afternoon walks, and I have to say that I'm absolutely ready for some greenery. It's only a matter of time before everything is transformed and I have a dense canopy of trees, lush shrubs, flowering dogwoods, cherry blossoms and the magnolias to enjoy. Some of our neighbors have magnificent specimens when it comes to trees and I do look for their transition every single year. On my drives I'm always observing to see if such & such tree on a particular property or street corner is blooming like it did in years past. Do you do the same? More often than not I walk around our trails without a camera, but on certain occasions I do take it with me in order to catalog the way our surroundings are at any given moment. It's time to show you a bit of spring here in eastern Pennsylvania. Keep in mind that things still seem a little bleak and bare, but nevertheless you can begin to notice where things are budding, where mother nature has decided to awaken from winter's slumber. I'm just so grateful that our weather has been cool and somewhat mild, because it's allowed me to spend a lot of time outdoors. I've been enjoying these daily walks. Even my cat, Lion, has been going out on supervised walks around the house. In fact he begs at the front door to go out, because he wants to nibble on the blades of grass like our resident groundhog, Henry. I can't say that I blame him one bit. Change is on the horizon and I welcome it! The days are so nice right now that it's such a pleasure to stand on the back porch. The glade looking out toward the eastern side of the house is always green, yet every single tree has yet to produce one leaf. Around this area is where I was gathering my Snowdrops just a few weeks ago. On the western side of the house we have a hill that is bordered with a good amount of forsythia. These shrubs are just starting to bud; look closely and you'll see hints of yellow. When the flowers come out it is absolutely stunning because it seems as if the hill is ablaze in yellow. 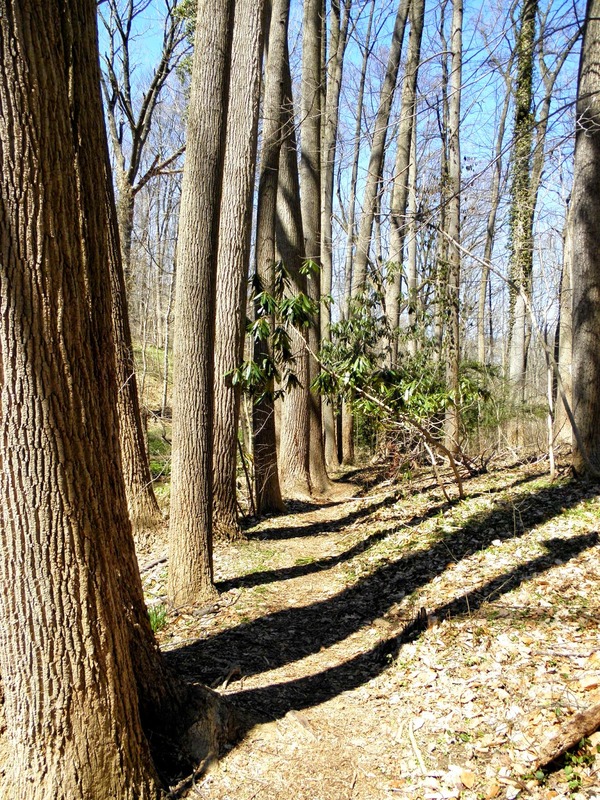 The trails near the house are great for afternoon walks (weather permitting) and since the terrain varies greatly from spot to spot, one can get quite a work out by walking them. On the upper right photograph you can see dozens of shoots from daffodils simply ready to burst. I can't wait to see the area blanketed by color. This past winter I wasn't able to walk the trails because we had large amounts of snow, unfavorable icy conditions and a lot of tree damage. Now that spring is here I am going to profit from the weather and take my walks for a bit of exercise. Along this trail just behind our house there is a giant maple tree that was uprooted during a storm. It came crashing down over the creek, knocking down several smaller trees in the process. You can't really tell from this photograph, but the diameter of that root system has to be at least 10 feet. 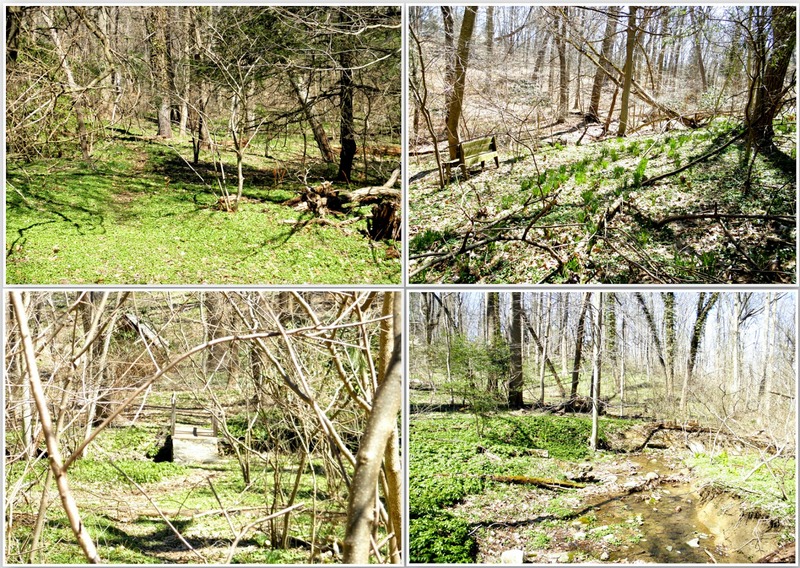 Here are a few more photographs of some of the damage I observed during my walk. The snow and ice storm that crippled our region toward the end of January brought down many trees and branches. The top left photo shows you that maple I was talking about (the house is visible up the hill from there). 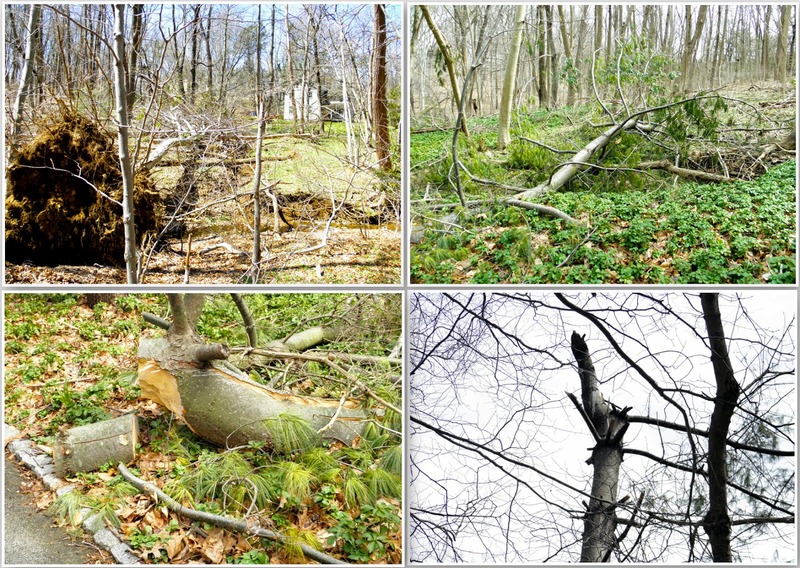 The other photographs show you hemlocks that either snapped in half or came down completely. Several years ago I thought these plants were hostas, but I was completely wrong. The shoots are Eastern skunk cabbage or Symplocarpus foetidus. I've read that this plant loves wetland conditions, so it's no surprise that many can be found along the muddy banks of the creek. It's fetid scent attracts bees. Large areas of pachysandra are common here in the woodland. It seems to thrive wonderfully where nothing else seems to grow. The spring house is surrounded by it. Something else I like to keep an eye out for is verdant blankets of moss. These velvety plants grow in clumps along damp areas such as this runoff from the spring house. I never disturb the moss, because to me, it adds to the age of the woodland and the property. The root system of this beautiful beech tree is covered in moss. I think it's beautiful! A very narrow part of the trail that runs along the creek always seems like I'm in the middle of nowhere. Here is the natural creek that twists, turns and cuts through the bottom of the valley behind our home. It's so calming to hear the water running when I'm in this area. Another favorite spot of mine. During the summer this part of the trail will completely be engulfed by shrubs and leaves. Here I am coming out of the small valley and onto the field. Again, we had a lot of tree damage in this area. Luckily, the giant walnut tree is still standing along the bend here. In a matter of weeks I expect it to be full of leaves. A patch of trail near that walnut was littered (in a good way) with these small pine cones. A friend of mine said that they were cypress pine cones. I find them to be so adorable that I plan to make a wreath from them sometime this year. Looking back across the field is always breathtaking no matter what time of year it is. Yes, I'm patiently anticipating spring's glory. Underneath this old fence is a robin chirping as happily as can be. When the robins are out you know it's only a matter of time. Some of my friends down South have been sharing their photographs of the landscape where they live, and I have to say that I'm rather envious knowing that their cherry blossoms are already blooming and that their crabapple trees & magnolias are full of gorgeous flowers. The season does promise change and renewal, so I hope you welcome it just as much as I do. Easter & Passover are right around the corner, then it's Earth Day and Mother's Day! Without a doubt there is a lot to do. 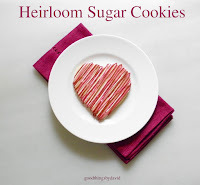 Keep your eye out for a cookie recipe that I'll be sharing soon; it's been awhile since I've done so and I promise you it will be delicious. I hope everyone is having a good start to spring! 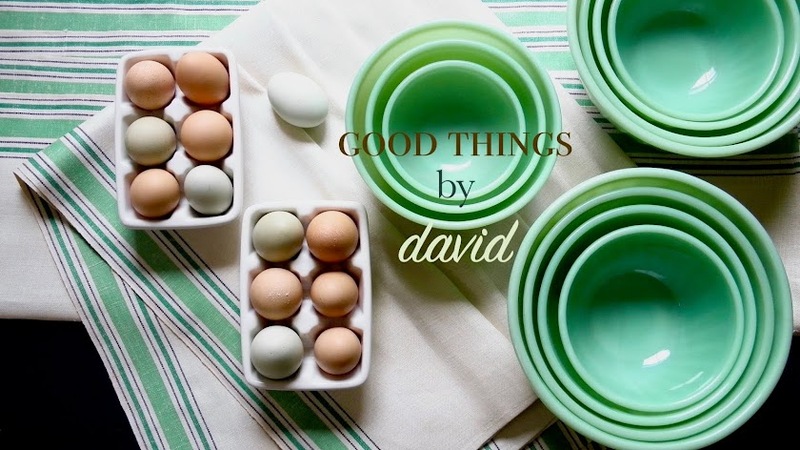 Oh, you are so much more patient than I am, David! While you appear to be gently encouraging Spring to come along, I am outside screaming at it to HURRY UP ALREADY! Which of course, I know is silly because I know very well that no season can be rushed! I need to learn to enjoy what my husband refers to as the "sleeping season", and it is posts like yours that reminds me of this fact! Ha! I'm only patient because I have no other choice. After that brutal winter I do want spring to be here in full force right now! However, I must wait for it. Thanks! 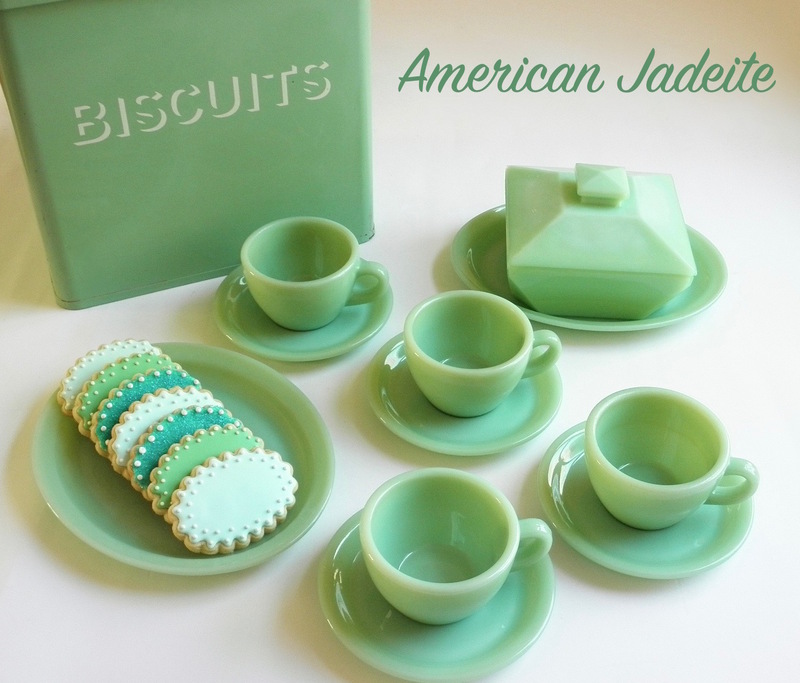 The jadeite color of the chicks is simple. Add a bit of leaf green to your royal icing to make a mint color and then add just a touch of "teal" paste coloring (I used Wilton). If you don't have teal add the tiniest bit of blue. Mix until you get the desired shade. Anette, you should photograph those parts of the woods where you live and email them to me! I'd love to see what your part of the world looks like.